The title itself says it all. Please take time out to read this very interesting article and feel free to share your thoughts. 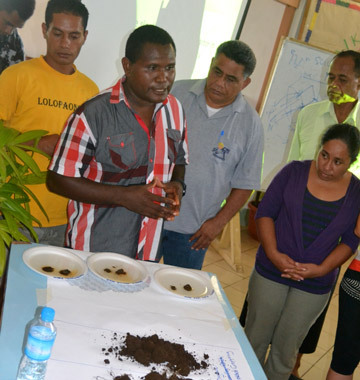 A programme to build capacity of youth in organic agriculture commenced last week in Nukualofa Tonga. The programme is the outcome of a partnership between the Pacific Organic and Ethical Trade Community (POETCom), Land Resources Division of the Secretariat of the Pacific Community (SPC), the United Nations Development Programme, OXFAM New Zealand and the Tonga National Youth Congress. The over all objective of this project is to enhance livelihood opportunities for youth in organic agriculture through training trainers and extension providers from organic associations in sustainable organic production methods. These organisations provide ongoing mentoring and support to young farmers and link youth agricultural enterprises existing organic certification and market chains. The Pacific is facing an aging farming population, the SPC Pacific Youth in Agriculture Strategy also highlighted that Agriculture is not being seen as a viable career option for young people and is often viewed as the job for ‘drop outs’. UNDP Representative, Asif Chida pointed out in his opening remarks that this creates grave concerns for future food security in the region. He noted that farmers hold the health of our nations in their hands and we need to create interest and opportunities for youth to engage in farming as a business. The train the trainers workshop held March 11 - 16 is a pilot programme in the Polynesia sub region. The 30 participants, 2/3rds of who are under 35, are from NGOs and organizations from across Polynesia including Niue Island Organic Farmers Association, Titikaveka Producers Association, Cook Islands; Women in Business Development, Samoa; The Department of Agriculture American Samoa; the Tonga National Youth Congress and Tonga Ministry of Agriculture and Forestry, Extension and Women’s Division. These organizations provide extension support and advisory services to the growing number of organic farmers in the Pacific region and to youth or schools farming programmes. After this pilot there are plans to take the training to Melanesia and Micronesia and to make the training kit for organic agriculture the Pacific which is being developed widely available. The trainers are Karen Mapusua, POETCom coordinating officer; Dr. Shane Tutua, a soil scientist and farmer from the Solomon Islands; and Kamilo Ali, Livelihoods Programme Officer from OXFAM New Zealand. The workshop covers the principles of organics, soil and plant health and animal husbandry. As the workshop progressed participants engaged in active discussion calling on traditional practices from the various countries and sharing some of the scientific explanations behind them as well as undertaking a variety of experiments and practical activities that highlighted that to be an organic farmer is really to be a scientist. Also discussed were certification requirements and the role of organic guarantee systems in building consumer confidence and developing markets for organic products- confirming the need for development of business and entrepreneurial skills amongst young farmers. By the conclusion of the workshop it was agreed that to engage youth in organics and the opportunities it provides we need to change the way we look at and talk about farming as a career and that extension providers are well placed to lead this change.